The Middle Ages encompass one of the most exciting periods in English History. The names of famous Medieval women scatter the History books - they were mostly queens and princesses. But what about the women who were not of noble birth? Who were these Medieval women who became famous despite the dominance of men during this era? The following biography information provides basic facts and information about the key dates and events in the life of Katherine Swynford who was famous as the mistress and later the wife of John of Gaunt. Katherine Swynford was a commoner who was the ancestor of the Tudors including King Henry VIII of England. Joan Beaufort, Countess of Westmorland. Accomplishments or why Katherine Swynford was famous: Her liaison with the Plantagenet prince, the rich and powerful John of Gaunt (1340 - 1399 ) produced four illegitimate children who were given the name Beaufort. John of Gaunt married Katherine Swynford in 1396 and their children, by this time adults, were legitimised. Their son, John, was the Great Great Grandfather of King Henry VIII of England. The story and biography of Katherine Swynford which contains interesting information, facts & the history about the life of this Medieval woman of historical importance. 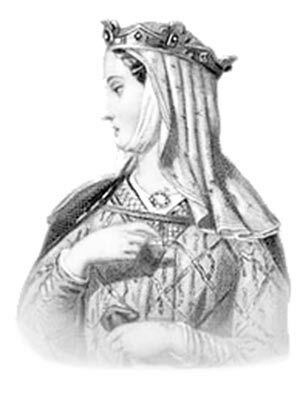 Katherine Swynford was born Katherine de Roet and was the daughter of a Flemish knight. Katherine de Roet was educated at a convent in Romsey. When she was fifteen Katherine de Roet left the convent and joined her sister at the English royal court. Phillippa de Roet was a lady-in-waiting to the wife of King Edward III whose name was Philippa of Hainault. Phillippa de Roet married Geoffrey Chaucer. Katherine was very beautiful and caught the eye of Hugh Swynford who was a knight in the service of John of Gaunt. Hugh Swynford wanted to marry Katherine de Roet. It was seen as a great match for Katherine as Hugh was a distinguished knight and owned a manor in Kettlethorpe, Lincolnshire. Katherine de Roet objected to the marriage. Hugh Swynford was rough and uncouth - a seasoned soldier. But marriages during this Medieval period were not based on love. Katherine had no alternative but to marry Hugh Swynford and move from the royal court to his manor at Kettlethorpe. Katherine and Hugh Swynford had three children - Blanche, Thomas and Margaret Swynford. The manor was very basic, devoid of luxury. Hugh Swynford was often called to arms and fought in some of the many battles, including the Battle of Poitiers, of the Hundred Years War, all of which took place in France. In 1369 Katherine Swynford, as the wife of a brave knight was called to Bolingbroke Castle to serve the wife of John of Gaunt, Blanche. Blanche contracted the Black Death and Katherine Swynford helped to nurse her until she died and apparently was responsible for finding a priest to administer the last rites. Katherine Swynford was invited to attend the funeral of Blanche. It is believed that the affair between Katherine Swynford and John of Gaunt started at this time. Katherine Swynford returned to the manor at Kettlethope and had been honored by John of Gaunt. The rewards were "for the care shown to the late Duchess and for the Lancastrian children after their mother's death". John gave Katherine Swynford her own blazon - illustrating three Catherine wheels. Her blazon was designed, bestowed and registered by John. He also rewarded her, as a pension, "all issues from, and profits from his towns of Waddington and Wellingere to be paid yearly". Hugh Swynford was recalled to France in 1371. During this time he died. There were many mysteries surrounding his death as he died by poisoning. He was believed to have been poisoned by Nirac de Bayanne, a faithful servant of John of Gaunt. There is no other connection between John and Katherine and the death of Hugh Swynford but it did give rise to rumours as John and Katherine's relationship developed. Following the death of Hugh Swynford Katherine Swynford was recalled to court to be the governess of the children of John of Gaunt. Their relationship was happy. They were in love. Katherine Swynford bore John of Gaunt four children. Their children at this time were referred to as the Beaufort bastards. The names of their children were John. Henry, Thomas and Joan. This was a turbulent and dangerous time in the Medieval era of the Middle Ages. The terrible Black Death had ravaged the country since its deadly arrival in 1348. It changed the lives of the English people forever. About one third of the English population died. Labour became valued changing the status of the peasants and serfs. This ultimately led to the Peasants Revolt in 1381. At this time King Richard II was just fourteen years old. His uncle, John of Gaunt was the most powerful man in the country. The peasants blamed John of Gaunt for the problems in their lives. During the Peasants revolt the mob reached London and the Savoy Palace, which belonged to John of Gaunt was burned to the ground. Following the Peasants revolt the affair between Katherine Swynford and John of Gaunt ended. There is no specific reason why this happened. The Black Death, the Peasants revolt and the criticism of their affair must have all taken their toll. The chroniclers at Saint Albans and Saint Marys Abbey, York described Katherine Swynford as "a witch and a whore" and a "she-devil and enchantress". Their parting was not on friendly terms. Katherine Swynford returned to the manor at Kettlethorpe. As the Lady of the Manor Katherine would have been expected to undertake all of the duties that would have been undertaken by her husband. Her life was busy. In June 1394 the second wife of John of Gaunt, Constance of Castile, died. John and Katherine were reunited. And John asked Katherine Swynford to marry him. Katherine Swynford married John of Gaunt on 13 January 1396 in Lincoln Cathedral and took the title of the Duchess of Lancaster. Their children were all legitimised. They lived together for three years until John of Gaunt died. During this time Katherine Swynford was effectively the first lady in England - a queen in all but name. After John's death, Katherine returned to Kettlethorpe and Lincoln where she died on May 10, 1403. Her tomb is in Lincoln Cathedral. This woman of humble birth became the ancestor of the Tudors and the greatest Kings and Queens of England. Some interesting facts and short biography information about the History, Life & Times of Katherine Swynford. Additional details, facts, history and information about the famous people of the Middle Ages and important events during their times can be accessed via the Middle Ages Sitemap.